Raised in Bartlesville, Oklahoma, Lura Pierce studied English ed at Oklahoma State, then taught for three years in inner-city Louisville. "The largest junior high in the state, 90 percent black," she says. "We learned about discrimination. It was the best thing that happened to me." As the wife of Presbyterian minister John Pierce, she lived briefly (and had kids) in Colorado and Texas, then spent 12 years in Spokane, where she raised the kids, got a degree in journalism, and taught for nine years at a private prep school. After the family moved to Eugene in 1989, she went for a UO PhD in curriculum and instruction. 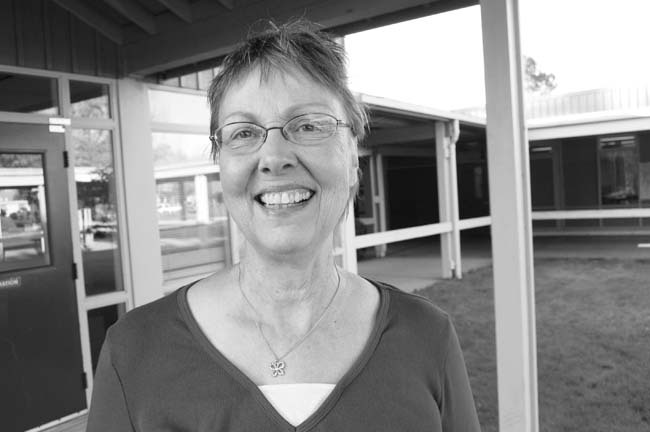 Dr. Pierce currently teaches sixth grade in her 18th year at Shasta Middle School. "I love teaching middle school; the kids are as honest as they can be," she says. "I'm passionate about imparting love of learning." Last May, Pierce's class completed a biography project on the 23 US Nobel Peace Prize winners, from Teddy Roosevelt to Al Gore, with a presentation at the Peace Park site in Alton Baker Park. The project earned her an award as peace educator of the year from the Nobel Peace Laureate Project. See a nine-minute video of the students' presentation at youtube.com/user/NobelPeaceLaureate.